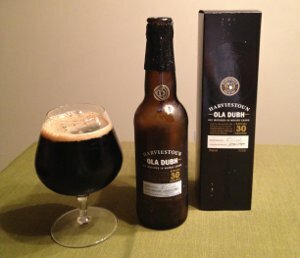 Ola Dubh is a series of beers aged in Highland Park Scotch casks. There are 5 vintage of casks used for this purpose, 12, 16, 18, 30, and 40 years old. A while back, I cracked open the 16, which was very nice, and the 40, which was astounding. Today, I'm ticking off two more vintages, so huzzah for that! Beer Nerd Details: 8% ABV bottled (11.2 oz.) Drank out of a snifter on 4/20/12. Bottle Number: 06270. Bottled in February 2009. Beer Nerd Details: 8% ABV bottled (11.2 oz.) Drank out of a snifter on 4/20/12. Bottle Number: 06942. Bottled in March 2009. So, after trying four of the five varieties, I'd say the best was the 40, followed by the 18, then the 30, and finally, the 16. Now I just need to get my hands on the 12. Strangely, it seems to always be sold out whenever I see some of this stuff, perhaps because it's also the cheapest of the family (and this stuff really is expensive!) I also have to wonder how the age has impacted these bottles. Every bottle I've ever had has been from 2009, including the two varieties I had last year. Would a "fresher" 30 be better? Perhaps! I guess there's only one way to find out, eh? Glenmorangie and Ardbeg (owned by the same company) both have releases aged in new American oak, but it's rare...it's more expensive, and you get some unique flavors. Scotch can be legally called Scotch as long as its aged 3 years in oak, though 10 is often the minimum for a smooth and palatable whisky. The main reason is climate; in America we get dramatic temperature swings between season, thus the whiskey here moves in and out of the wood more readily. Scotland, as far as I can tell, has just the one season (you know, cold and wet), thus it takes longer for whisky to mature. This is probably way oversimplifying things. I enjoyed reading about the various beers from these guys...now you need to get a bottle of Highland Park! The 12 yr is inexpensive and excellent =) no smoke to speak of, but huge notes of heather and honey, and mild peat. the 15 is also excellent, the 18, not so much, and the 25 is phenomenal. I saw a tweet from Joss Whedon last night about how he's been saving a bottle of Ardbeg for today (the day The Avengers comes out), but he couldn't wait. He was drunk tweeting last night, and it was pretty funny. Anywho, thanks for the info - I remember reading something similar about the climate whilst doing my comprehensive research on bourbon barrels this week (by which I mean, the half hour it took to figure out why we use "new" oak). I think something said that the Water in Kentucky also makes a big impact. And dude, I have a bottle of Highland Park 12. It's actually my, er, everyday Scotch... even though I don't really drink Scotch every day. The Balvenie 15 is for special occasions, the Ardbeg 10 is for when I want a smokey, peaty monster, but the Highland Park 12 is my go-to if I'm just in the mood for something Scotchy. What I'll try to do is find a bottle of the Ola Dubh 12 and do a double feature with that and a dram of actual Highland Park 12. Should be fun! If I can find a bottle of Ola Dubh 12. I swear, it's always sold out! This page contains a single entry by Mark published on May 3, 2012 8:40 PM. 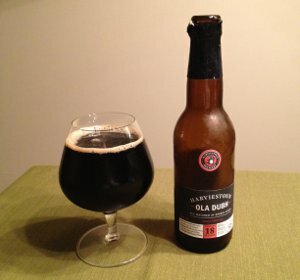 Founders Kentucky Breakfast Stout was the previous entry in this blog. Sanctification is the next entry in this blog.